Guest post: Let’s restart the climate change debate – test the models! Figure 1.4 of AR5: the observed global surface temperature anomaly relative to 1961–1990 in °C compared with the range of projections from the previous IPCC assessments. After 26 years of debate, US public policy on climate change remains paralyzed. Polls show that it ranks near the bottom of American’s concerns. We even remain poorly prepared for a repeat of past extreme weather, such as a major hurricane hitting an East coast city – let alone future climate. Both sides rehash their arguments, accomplishing nothing. Climate scientists can begin to restart the debate and rebuild public confidence: re-run the climate models from the first three IPCC assessment reports (ARs) with actual emission data (from their future). See if they can show that models predict the observed global temperatures with reasonable accuracy. The cost of this project would be small compared to the overall funding of climate research and a dot compared to the potential costs of climate change. The famous “spaghetti graphs” — one the most-cited graphics from the ARs — shows the forecast of models used in each report vs. actual global average atmospheric temperature. They tell us little, as in the above graph from the most recent AR. It packs too much information into one graph, but does not show what we most want to know: the accuracy of their forecasts. Each line represents a temperature forecast with specific assumptions of greenhouse gas (GHG) emissions. How well do the models work if input with accurate GHG emissions? The answer can provide a fair test of the major climate models, one acceptable to both sides in the policy debate. A brief explanation of the models shows why. Climate models don’t predict emissions of CO2 and other greenhouse gases; emission scenarios are inputs to the models. The models use these to generate projections about future climate. A large body of research describes how to validate climate models. Most do so using “hindcasts”, running models to “predict” the global average temperatures of past decades. It’s necessary because we know neither the temperatures nor emissions of greenhouse gases and aerosols in future decades. Unfortunately, for many reasons hindcasts do not provide compelling proof. Most importantly, they are too easily tuned to match past data — even inadvertently. For similar reasons scientists use double-blind testing for drugs wherever possible. Philosopher of science Karl Popper believed that predictions were the gold standard for testing scientific theories. The public also believes this. TV shows and films often focus on the climactic moment in which scientists test their theory to see if the result matches their prediction. Now climate scientists can do the same for their models. Take the models used in the First Assessment Report (FAR, 1990), the Second (SAR, 1995), and the Third (TAR, 2001). Run those models using actual emissions as inputs, with no changes of the algorithms or baselines. 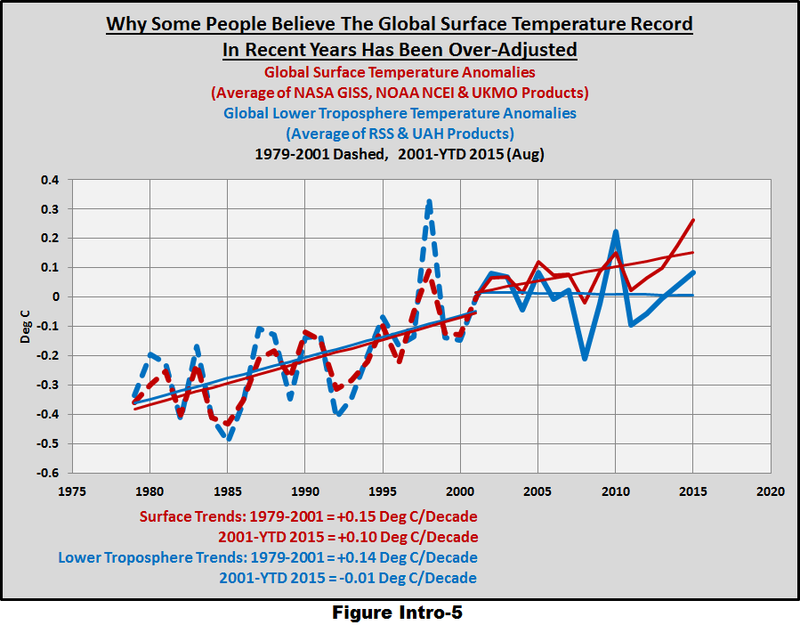 How accurately will the models’ output match the actual global average surface temperatures? This has been done before in rough form, but never completely and recently – as warranted by the scale of the threat. It’s not the time for short cuts and partial tests. The resulting predictions would provide fair tests of the models’ skill over significant periods: 25 years since FAR, 20 years since SAR, and 15 years since TAR. The top line results would be useful for the public and our leaders, and also provide the basis for more sophisticated analysis by scientists. If those early models worked well, then we can assume later models work even better. If those models could not successfully predict over several decades, then the public could reasonably require more evidence before spending trillions of dollars — or even making drastic revisions to our economic system, as urged by Naomi Klein in This Changes Everything: Capitalism vs. The Climate and Pope Francis in Laudato Si’. The Federal government should fund a project to re-run the models, and post the results as soon as possible. The debate can restart no matter what the results. As the Romans might have said when faced with a problem like climate change change: Fiat scientia, ruat caelum. Let science be done though the heavens may fall. Tags: IPCC, models, projections. Bookmark the permalink. This is an excellent proposal. I do wonder why it hasn’t been done already. Why would they want to evaluate model performance? After all, they are only “scenarios”, not predictions. Today we have far too much computer modeling and far too little experimental physics, which is where this should be decided, not in the bit splicing of proxies a thousand years old that frankly seems, especially after reading the climategate II emails, much like the world of alchemists a thousand years ago, getting money from the King to research how to turn lead into gold, or in this case, how to influence the development of a global civilization. Climate science is far too important to our future to leave it in the hands of climate scientists, its time to bring in the adults, the experimental physicists who can give real answers. If you have circa 100 models all projecting/predicting different future outcomes, you know as fact that 99 of them are wrong. With such a failure rate, is there any confidence that 1 of the 100 is right? And if so, the problem is that one cannot identify at the time of the model run, which is the right one. The fact that there are circa 100 models confirms that the science is not well understood, nor settled. If the science was well understood, there would be no more than 3 models each one using a different CO2 emission scenario, or perhaps a maximum of 9 models each one using a different aerosol emission scenario in addition to the 3 different CO2 emission scenarios. We know the models are useless since of the model runs performed in 2006 all but 2 are way off target (beyond the 95% confidence level) and if these models are better than those used in FAR, SAR and TAR, it is difficult to see what further testing of the earlier models will achieve other than to further confirm how poorly models are at projecting/predicting the future. If anything it is time to scrap the models until we have a better grasp on the fundamentals and until we have better quality input data (satellite data and ARGO data of sufficient timescale to be useful – the land based thermometer data set having become too horribly bastardised to now be useful). Work on good quality data and then and only then may we have some idea of what is actually going on and why. At the very minimum all the models that are way off target should be culled, and we should be working only with those models that are broadly in line with the pause and trying to refine the better models (although I suspect that the better models are only so fortuitously, ie., per chance and not because they better model the dynamics of Earth’s climate system. All rerunning the models would prove is that with actual data they can be tweaked enough to perform hindcasts. Given that we need forecasts the ONLY way of verifying them is to compare the forecasts made a decade ago with what actually happened. The notion that they may work better with actual emissions info is a red herring. The models at the time were run with varying emissions assumptions some of which are close to what actually occurred. They did not do well. The funamental problem actually isn’t the models, its the data used to create them. I used to do (relatively simple) financial modelling for a bank – I just implemented them, someone else did the design. During the testing phase we were asked to run through existing projects to compare the model outputs to the real world. It matched close enough so the model was approved. Then of course the banks went “mamaries skyward” a few years later and the model didn’t fit any more. The data provided didn’t catch that. The model failed. In climate, data proxies are guesses – nothing more. There is no way to verify that any proxy behaved hundreds or thousands of years ago the same way it behaved in the much shorter periods used to create and verify them. That is also before we get into the questionable stats methods applied to them when bringing them together for a reconstruction. Current temp data is also a guess. Adjustments are of course justifiable, but ignoring that for the moment are we really saying a few thermometers (and it really is a few if you consider the surface area concerned) here and there are really all accurate, to decimals of a Degree C ? Can we really in-fill the gaps reliably ? The room I’m sitting in varies by 2-3 Deg C from one side to the other. Two measurements tens or hundreds of miles apart can’t (IMHO) be used to represent the areas in between. So models based on both of those are pure speculation. Certainly not enough to justify the idea of either investing £tns in mitigation or crashing the industrial economies into some buffers. Thank you all for the comments! Here are some brief replies. The IPCC uses models to run “projections”: these are predictions based upon scenarios (“RCP’s” in AR5) of future conditions (e.g., emissions of greenhouse gases, aerosols). Climate scientists might agree to this proposal because many of them are unhappy with the policy gridlock and believe that their models work. This test would be a step to both fixing the problem and validating their models. Testing the models is experimental physics. Your comment illustrates why the policy debate is gridlocked. You believe you are correct. Climate scientists believe they are correct. No amount of statements by either side will change that. A simple test, relatively cheap to run (as climate science goes), can provide facts that might restart the debate. You misunderstand the proposal. This proposal calls for a run of the models used in the first three AR’s using data from their future (i.e., after the publication of each AR). So there would be no “tweaking” or tuning. The models use instrument data (e.g., CO2, temperatures) — in this test from 1990 on. Not proxies. The small (but growing) gap between the surface atmosphere and the lower troposphere temperature datasets is a separate issue (see this graph: https://wattsupwiththat.files.wordpress.com/2015/10/figure-intro-5.png). One step at a time. That’s how both science and public policy usually advance. If a broken clock is correct twice a day, how much more useful is a broken clock than an ensemble of climate models? My first contact with global climate models was as a postgraduate student in the 1970s. I recall the general view then was they were a bit of a joke, and could produce anything and everything in a generally bewildering manner. I still have a somewhat jaded view, only now I see the modellers not as pioneers having some fun, but as illustrators or illuminators for the Great Cause of Scaring People About Their CO2 . Climate modelling with computers is now no small industry (see, for example: http://www.wcrp-climate.org/WMAC.shtml ) They meet often to coordinate model inputs and algorithms, and numerous working groups have been emerging with specialities such as GEWEX (http://www.gewex.org/) organised by ‘Travesty’ Trenberth, the man who went in the face of leading experts to milk the hurricane season in the USA, in a press conference in 2004 where he claimed that global warming will continue to spur more outbreaks of intense hurricane activity (http://www.ucar.edu/news/record/transcripts/hurricanes102104.shtml , and see also chapters 26 and 27 of Laframboise’s ‘The Delinquent Teenager’ where she quotes a genuine hurricane expert, Landsea as saying ‘the refereed literature in my field and the consensus by the folks active in [studying] tropical cyclone climate variability conclude the opposite to what Dr Trenberth is advocating publicly’). I cannot trust men like Trenberth, and so I remain suspicious and cynical about the modellers he associates with. Unfair on them perhaps, but they are docile and generally silent as the political and economic and educational damage their models help sustain has spread far and wide. I have little doubt that earlier runs of the models produced flatline global mean temperatures, as well as declining mean temperatures. Why not, given the tiny change being imposed by annual increments of CO2? But I suppose those runs were nipped in the bud, or discarded on the cutting-room floor as not at all suitable to illustrate the heating effect of CO2. If the early models were to be ‘re-run’ (assuming they still exist in their original forms), if it suited the zealots, they could surely extract and big-up model runs that roughly fitted what we have seen in the past decades. But what would that mean? Not much really for science. The modellers have admitted as much in an IPCC report where they said they do not do forecasts because they are impossible. But it would mean a lot for PR outfits and PR-minded folks such as Trenberth, who might find it hard to resist trumpeting the runs as evidence that the models can be relied upon for policy-making. If no such flat-lining model runs could be produced, for whatever reason, then would it stall the zealotry? No. Many promoters of scares around CO2 have already distanced themselves from relying on models. Hansen for example (http://rabble.ca/books/reviews/2010/03/James-Hansen-climate-reckoning), and Betts (cartoon here: http://www.bishop-hill.net/blog/2014/8/30/inspirational-betts-josh-289.html, with link to original words below it). There would be no big PR opportunities for The Cause, and there is no big-PR on the side of the angels in this game – only scattered centres of reason, and a good many tiny initiatives like this blog. A final point for the jaded cynic, is who can be trusted with these models anyway? My preference would be for a new group, clearly independent of the IPCC and associated campaigners. A body of computer and climate system experts willing to spend a couple of years getting familiar with the reams of code from one or more prominent models, working through it with fine tooth combs, and then running them with their eyes wide-open and their expectations well-informed. But what talented people would give up two years for such a wretched task? Maybe if it were to be funded very generously and made to seem vital for policymakers and scientists. But then, where would the independence be, and how plausible could that ‘vital’ be made to seem anyway? The AGW hypothesis predicts a dependency relationship between the radiation budge and CO2 levels. So if we could reliably measure both, we wouldn’t need complex models – we could just plot these two against each other and so either confirm or falsify the theory. Child’s play. The reason we can’t do this – and are therefore reduced to depending on the models – seems to be that while CO2 measurements are reliable, energy budget ones are not. If so, perhaps a better ‘restart’ on the whole question would be to divert money from elsewhere (models? ), and put it into getting good energy budget measurements. This raises a more important question for me – do these older climate models exist in any kind of meaningful or substantial way any longer? Would we find out that, like CRU’s data, they had conveniently been “lost”? And then everyone just ignored it. You have educated yourself about the climate change issues and have strong opinions. But that’s true of those on the other side of the debate. We are long past the time when strong opinions change break the gridlock about this important public policy issue. It’s preventing us from even preparing for the inevitable repeat of *past* climate. We need a test that both sides can accept to provide at least a first step forward. Von Storch’s paper is quite different than my proposals. First, it is another hindcast, run vs scenarios of past years (not actual data). So far dueling hindcasts have not unlocked the public policy debate. I doubt a few more will, either. Second, he ran models of the two most recent AR’s, not the first three (CMIP3 was released in 2010 & used in AR4; CMIP5 was released in 2013 & used in AR5). Third, this paper was released in 2013 — but not published in a journal, let alone a peer-reviewed one. The paper that breaks this must be like Caesar’s wife, of high repute. The CMIP5 ensemble uncertainties are beginning to look a bit ridiculous ! Not all climate models can be correct! good to read another blog by names I regard as worthy to read on the climate & related topic. only comment so far, so OT – all the above comments & post text font comes out strange for me ? is it only me & i need to change a setting in explorer !!! To that end, rerunning the models would be a further waste of electricity that could be better used to properly toast an English muffin. Perhaps you are right. Perhaps those that disagree with you are right. For 3 decades we have listened to both sides trade confident assertions. The result: political gridlock, so that we’re unable even to prepare for the inevitable return of *past* weather. Let’s try something different. Successful predictions are the gold standard of science. If the models can do so, then we know more than we know now. If the fail, ditto. The funding should indeed come from the government directly. A science funder would not fund a project that only makes sense if all scientists are in a conspiracy against humanity. They would thus argue that the hindcasts are good enough or at least that given limited funding and many other research proposals that bring science forward this does not not have enough scientific priority. But I could imagine that it does have enough political priority. Editor, you wrote that hindcasts are run not with actual data, but instead with scenarios. That is incorrect. Hindcasts are run with actual, historical, observed forcings including solar insolation and greenhouse gas emissions. For example, see the CMIP5 project’s instructions to modelers, about what forcings to use: http://cmip-pcmdi.llnl.gov/cmip5/forcing.html. You can’t suggest to restart a debate that you lost. The science remains uncertain, as all science is uncertain. The models, like all models, will be forever wrong. The question is “are they right enough” to give guidance to policy makers? That question, is best answered by ……. policy makers. And since they are making policy based on guidance from climate scientists and models, the question of model’s adequacy is moot. Ed Hawkins has a less cluttered, and updated to 2015, version of the CMIP5 graph here. The models are run using historical data about the past, and scenarios about the future. That’s why the IPCC calls the results “projections”, not predictions — because they output depends on the scenario input. In every study using models the authors state what scenarios they used. The Representative Concentration Pathways were used in AR5, and are the most commonly used now. In the US, polls consistently show that the public ranks climate change dead last among major public policy concerns — making strong policy action almost impossible in this major source of emissions. The governments of the major emerging nations — the major source of new emissions — remain strongly opposed to actions that might slow their economic growth. So the rest of us will look for ways to break the policy deadlock. My guess (emphasis on guess) is that no substantial new policy measures will be taken in the foreseeable future. If you are right about policies being made, then all will be well. If not, then at least you’ll have enjoyed your victory lap today. Editor, I understand your reply to me. My comment was in response to what I thought was an incorrect statement by you in one of your comments, but I failed to quote it and now cannot find what I saw unless I misinterpreted your comment about the Von Storch paper. I apologize for misunderstanding. That is a clear graph of the projections from the IPCC’s AR5. But I’m more interested in those from the first three assessment reports, since sufficient time has passed to evaluate them (25 years from FAR, the multi-decade period climate scientists require). I’ve replied to almost 50,000 comments since 2003. In only a few dozen have people admitted errors, showing a greatness of spirit rare today. That CMIP5 graph includes dotted lines showing an attempt to adjust those model projections to reflect actual forcings, by Schmidt, Shindell, and Tsigaridis (2014), which is available at http://www.nature.com/articles/ngeo2105.epdf?referrer_access_token=ka7Fq_3Y89aAFYC9FtraMNRgN0jAjWel9jnR3ZoTv0N4NPgDFgfHJ2b91zjF64w30CipXaPRqIKM314rg1g_WOihxK8MTbSw0tRbgCF5xkEdriLn8q_aifMFetkY-n23LNVq_H9n0aeukAIQXfzp-_Z_ZV3e06ETIbafqZfEnb-zfPgCKHgUZSHTLQlA4kVJjfhP57nCjToIySH9J_Z4O7V2lRSfiMOYtyXpc01U1maxuP0BQ3l2TFt1lnKT_e96&tracking_referrer=www.realclimate.org. You can go back further than AR1 when considering models. In 1984 Hansen et al 1984 published results from a 1D model using realistic estimates for ocean energy uptake. The actual figures for 2010 were 390ppm for CO2. GISS shows an increase from anomaly -0.2C in 1880 to 0.71 in 1970, an increase of 0.91C. 2015 has passed 400ppm This year is en route for 0.81C,an increase of 1.01C. If a model more than 30 years old can get this close, I see no reason to condemn its successors. AR5 describes the model outputs as projections: “the simulated response of the climate system to a scenario of future emission or concentration of greenhouse gases and aerosols … distinguished from climate predictions by their dependence on the emission/concentration/radiative forcing scenario used…”. Nothing is accomplished by comparing model outputs unless their inputs (chiefly, emissions) match the actual numbers for the period following their publication. If the inputs do not match actual future emissions, then we learn nothing by comparing the temperature output with actuals. That you consider the assertions of activists such as those at Skeptical Science as sufficient reason to undertake multi-trillion dollar changes to the world economy is odd. It should not be necessary to say that a majority of people in the US don’t do so — and governments in the emerging nations are even less impressed. When there are strong tests in the peer-reviewed literature — or the equivalent — then there is at least the possibility of breaking the gridlock. Until then both sides will yell about the contents of their favorite websites. There probably will be no substantial public policy actions on a global scale. Eventually the weather will decide the debate. The result might prove unpleasant. I have blocked one comment from Tom Dayton when he attempted to post another link to a misleading claim about model/observation comparisons by the activists at skeptical science. There is a comparison here in the latest IPCC report. Tom has been allowed plenty of comments here. By contrast, the site that sent him here has banned dissenters from commenting at all. You diet of reading activists has given you quite a distorted vision of this debate. It’s agreed by almost all climate scientists that models can be reliable be evaluated only vs multi-decade histories. Hence my proposal focuses on the first 3 assessment reports. Results from the most recent two are as yet impossible to validate vs actual. If they match, activists cheer and skeptics note the short time horizon of the test. If they don’t well match, vice versa. Playing such games is entertaining, but accomplishes nothing. Meanwhile the clock runs on. Labelling Sceptical Science as activists tends to indicate that the labeller has a mindset known politely as climate change sceptcism or impolitely as climate change denial.. The title of this blog “Let’s restart the climate change debate ” should reflect a desire to discuss the science, not rehash old biases. Please reassure me that this is a genuine debating forum, and not another thinly disguised denier site. I wonder what AR5’s authors intend to show by these graphs of current models’ projections? This one shows projections from 2005, although the models were run after 2010 (probably closer to 2013-14). The brief period of results since their runs tells us nothing. Without strong validation, I do not understand why they expect the world’s government to take massive public policy actions on this basis. Especially since this is report #5, and the response to the first three was so small. As they say at Alcoholics Anonymous, insanity is repeating actions yet hoping for a different result. Do you believe that Skeptical Science is not run by activists? The debate is largely run by partisans on both sides. IMO it’s one reason the policy debate is gridlocked. Closing your eyes to this doesn’t help. They make ten accusations, none correct. Some of Pielke’s views were cutting-edge when made, and are now consensus science (e.g., about the use of ocean heat content as the most accurate measure of global warming) This is a disgraceful attack on someone with a long distinguished career, having one of the highest H-indexes in climate science. As I pointed out earlier, published model projections from 1984 accurately projected 2010 temperatures. Do you regard 24 years as sufficient time for validation? Please point to a peer-reviewed study showing that the 1984 projections matched the actual temperatures using close to accurate emissions data. This thread has had so many comments on this exact point. It’s the key to evaluating models, as the literature shows. Do we have to repeatedly go over the same ground? I referred you to Hansen et al 1984 ,, the peer reviewed paper in which the projection was made. Check Table 4 and Figure 18. For CO2 values go to the Scripps website . For temperature data go to the GISS dataset. .
Why do do need a peer-reviewed paper to make a comparison that you can make for yourself with five minutes of research? Do you believe that this site is not run by activists? Remember, the debate is largely “run” by partisans on both sides. I think the word is professionals. Those managing and writing on the site are scientists with experience in the field. Gavin Schmidt, for example, is head of NASA GISS. The information they provide comes from peer reviewed science. It rwflects observations, measured reality and theories based on conventional physics. The information they debunk varies from slanted propaganda to pseudoscience. As for Roger Pielke sr, his idea of measuring warming by ocean heat content works well. I have done similar calculations myself. Other ideas have not worked as well. Overall I would not regard him as a reliable authority on climate change.Like Paul Matthews and yourself, his biases tend to show in his writings. I see where you are in the debate. Nice that you are such a climate science authority, able to decide which scientists are correct! And we have to love your “I have done similar calculations” Were they published in the peer-reviewed literature (like Piekle Sr.’s)? What’s your H-index in climate science? I’ll pass on making further replies to you. – An awful lot of peer reviewed science is absolutely godawful. Peer review is no guarantee of quality, accuracy or utility whatsoever. Retired science teacher. There is enough data around to check things like energy budgets oneself rather than just relying on other people. Most of it is simple physics. Do you find it contradictory to demand peer reviewed evidence.while condemning peer review? Thank you. Encountering another standard denier straw man has finally convinced me that I won’t find rational debate here. Goodnight. False. Neither you nor I have the code to run the model with instrument data since its publication. Odd that you keep repeating the same incorrect point. So you believe the vast literature debating key points involved in modeling future climates is unnecessary, because it is just “simple physics”? I doubt any climate scientists will agree. To see the complexities read the dozens of papers giving explanations for the pause (their term) in atmospheric warming. In the spirit of this blog title I’m asking for a genuine clarification, and hope you can respond in kind. I’m not trying to catch you out our play ClimateBall – I just find this confusing. It’s difficult to follow unthreaded comment threads! Let’s replay the tape. (1) I point to Roger Pielke Jr, who compares Hansen’s assumptions about emissions vs subsequent observations. They don’t closely match. But then, it is unreasonable to expect accurate predictions of such things — as they depend on political, economic, and technological developments. (4) entropicman’s reply is typical of alarmists when called upon for evidence. Like a threatened squid, he squirts ink and runs away. (a) He compares my comment with something said by dwestonfront, and replies “Do you find it contradictory to demand peer reviewed evidence.while condemning peer review?” No, it’s not contradictory; I’m not responsible for dwestonfront. It’s the usual contextual sloppiness of discussions in comments. I showed that there were dueling blog posts about the forecast accuracy of Hansen’s paper. But more importantly, the standard of evidence for assertions — such as that Hansen’s prediction was accurate — is the peer-reviewed literature. Not blog posts, no matter the author of the subject.